Boston, Wednesday, 1 February 1860: I must begin to teach Morris his letters ─ he is nearly 4 years old ─ and a queer little mortal too. It happened to be raining hard in this nether sphere of ours, and I suppose Morris thought ‘up there in the sky’ was a forlorn kind of place at best. Boston, Wednesday, 7 March 1860: Morris’s birthday – bless the darling! Four years old – a big baby-boy whom I mean to keep a baby as long as he will let me; a picture child, with his lily white skin and rose cheeks, brightest blue eyes and long loose curls of wavy golden hair. And yet a most tempestuous child at times, though he looks a little seraph. 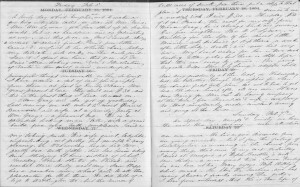 Philadelphia, Saturday, 28 April 1860: Sam & Annie [Shober] came round last evg. Children went over there after breakfast to see their “baby cousin.” He is really a noble little fellow, with splendid dark eyes. Took the children & Fanny [Gray] to see Aunt Regina [Shober] this morning. Morris would not go near her at first. I think her dress the like of which his eyes never beheld before repelled him – he was not exactly frightened, but he evidently thought her a rather portentous apparition. 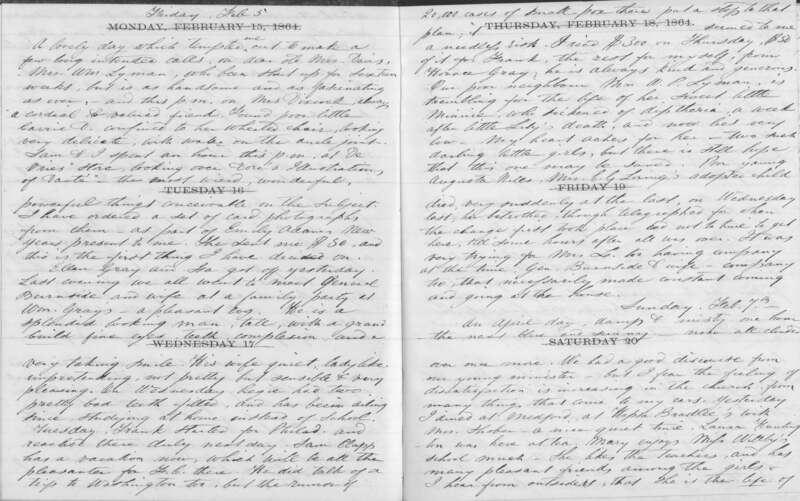 Boston, Thursday, 10 April 1862: In order to teach him the commandments in the least burdensome way I read them to him once every evg. before beginning his bible story. And he reads them in the morning to me, while I am dressing. He knows them now but he cannot bear to pass a word unexplained; accordingly the 7th comm[andment] has been a great stumbling block. I had to tell him it was a terrible sin – that he could not possibly be made to understand now – no little child could – but when he should grow older, and understand its meaning, he must remember that his mamma begged him never to be tempted into committing that sin. The Morris Gray Lecture Fund at Harvard is named in his honor. All excerpts from the Hedwiga Regina Shober Gray diary, R. Stanton Avery Special Collections. Mrs. Gray’s younger brother Samuel Lieberkuhn Shober (1828–1902) married Ann Bond Cochran in 1858. The Shobers’ first child, John Bedford Shober, born in August 1859. The diarist’s niece, Frances Loring Gray (1843–1919), who married William Adams Walker Stewart in 1874. Mrs. Gray’s aunt and namesake, Hedwiga Regina Shober (1786–1865). How sweet thanks for sharing. I wish now we had done a better job of capturing our little ones expressions. Thanks, Linda, Nancy, and Annie!